TODAY WAS THE GREATEST SNOWFALL IN RECORDED HISTORY. BEHIND THE 55.9 INCHES THAT FELL IN 1995-1996. WAS THE SECOND GREATEST SNOWFALL IN RECORDED HISTORY. BEHIND THE 65.5 INCHES THAT FELL IN 1995-1996. 24.4 INCHES FROM 16-17 FEBRUARY 2003. Blog posting and updating have been interrupted by an extended power outage and continuing Comcast cable outage. Thank you for your patience. Original post: Here are some snowfall totals reported by the National Weather Service as of 10:42 am for the Washington/Baltimore area. At noon, Washington National was reporting heavy snow and an increase of 1" to 15". Dulles and BWI both reported moderate snow; BWI increased 1" to a current depth of 22" on the ground. 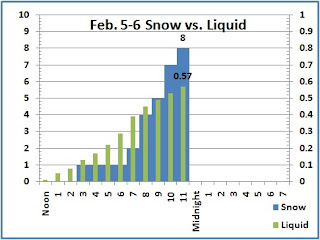 As noted earlier, Washington Dulles easily broke its daily snowfall record for Feb. 5. The liquid precipitation for the day of 0.99" also more than doubled the old record of 0.46" set in 1998. The 8.7" of snow at Washington National broke the more substantial record of 7.5" set in 1892. The season's total so far of 36" puts 2009-10 within striking distance of surpassing the number 10 seasonal total of 37.7" in 1979. The month-to-date amount of 12", however, is still over 5" short of breaking into the top 10 February list. The 7.8" at BWI breaks the old daily record of 6.4" in 1899. 11 PM Update: Colder temperatures and higher snowfall rates have picked up the accumulations significantly since early this evening. National now has 8" on the ground, Dulles has 10" of new snow, for a total of 11" on the ground. Baltimore/BWI has 6". Wall-to-wall coverage of the checkout lines at Giant supermarket, snow shovel buyers at Strosnider's Hardware and Home Depot. Don't forget the live shot from the salt domes. Do they have your attention yet? DISCOURAGED TONIGHT AND WILL BE VERY DANGEROUS. STORM WILL ALSO BE THREATENED. Snow began falling in the mid to late morning; here in Montgomery County MD it started with some very tiny flakes and a temperature of 37° at 10:40. The pace picked up into early afternoon, but even after several hours of precipitation, the temperature was only down to 34.5°. The above-freezing temperatures kept paved surfaces wet for several hours. Although residential streets are now snow-covered, conditions were not treacherous enough to prevent the UPS man from delivering on time a reinforcing supply of warm Gold Toe Socks. It's still early into what is shaping up as a major storm, but in much of the metro area, it would have to be rated as underperforming its advertised target of 2-4" this afternoon. As of 4 pm, only Dulles was in the range with 3.4", which was a record for the date, since the old one was a puny 1" in 2001. 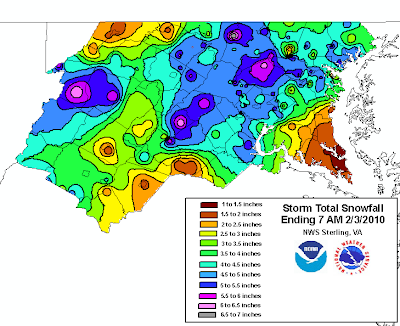 National was at 1.1", and BWI had only a trace. We noted here earlier that the major risk to the forecast for a record-breaking event was the liquid vs. frozen precipitation issue, and that is certainly still the case. In the past hour or so, radar indicates that the rain/snow line has advanced northward from Richmond to near Fredericksburg. The chart shows the accumulated frozen and liquid precipitation at Washington National through 6 pm. The scales are in the ratio of 10:1 of frozen to liquid, so if the green is ahead of the blue, the water content is relatively higher (lower frozen to liquid ratio). Check back for updates as conditions warrant through the storm. Feb. 5 Update: The final total of 2.51" at Jackson MS blew away the old record of 1.75" from 1956. Midnight Update: Unofficially, Jackson received at least another 0.57" before midnight, which would break the daily record. An additional 1.20" at Meridian pushed that total over 2". Gulfport MS got 2.26" in 6 hours. The total at New Orleans was also over 2". Mobile AL had 1.76" in 6 hours. The storm system now developing along the western Gulf Coast has prompted widespread Winter Storm Warnings through the Mid Atlantic region and even a Blizzard Warning for the New Jersey and Delaware coasts. Precipitation amounts can't be taken too literally, since precipitation is the most difficult of the various meteorological parameters to forecast, but model forecast accumulations have continued to increase. This afternoon's output from the GFS model, for example, shows total liquid precipitation amounts (in the dark red area) from 2.5"-3" through much of Virginia and the southern half of Maryland. Feb. 7 update: click here. 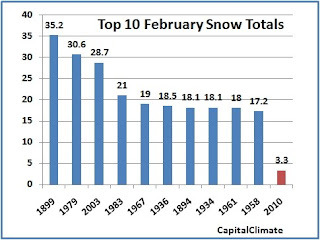 With 3.3" of snow recorded so far this February and a major storm widely expected this weekend, how much would it take to break into the all-time top 10 of Washington February snow totals? Generally, it takes at least one large storm to reach the 17.2" minimum for the top 10. In 1958, #10 on the list, 14.4" fell on Feb. 15-16. The only other measurable snow that month was 2.8" on the 1st. In December of that winter, 11.4" had already fallen on Dec. 3-4, and the season wound up with another double digit month in March spread over 3 separate storms. That was enough to put 1957-58 into 7th place for seasonal totals. In 1961, #9, 3 storms provided 8.3" on Feb. 3-4, 6.4" on the 8th, and 3.3" on the 12th. No other measurable snow fell the rest of the month, however, and the temperature reached 70° twice, on the 19th and the 27th. February 1934, #8, also had no single storm over 10": 8.1" on the 1st-2nd, 1.5" on the 5th-6th, 1.8" on the 19th, and a few other small amounts. February 1936, #6, saw 14.4" on the 7th, but the remainder of the total was made up of 1.8" on the 18th and scattered minor amounts on 3 other days. In 1983, there was a major storm (possibly an analog to the current one) with 16.6" on the 10th-11th. The only other measurable snow was 4.4" on the 6th. That was enough to put that year into 4th place. The 2nd and 3rd place years, 1979 and 2003, had the infamous President's Day Storms I and II, 18.7" on the 18th-19th and 16.7" on the 15th-18th, respectively. Major Winter Storm of Hysterical Proportions? Feb. 3, Midnight Update: The GFS model continues to be consistent, a little drier (more realistic), a little less warm than the NAM. Although precipitation amounts are still very high, the rain/snow line is still a concern for snowfall amounts, especially in the immediate Washington/Baltimore area. Feb. 3, 9:35 PM Update: The evening (00Z) NAM model has reached 60 hours within the last few minutes. There are no surprises, although the forecast storm position for Saturday morning is closer to the coast. This brings in more warm air and increases the chances for precipitation mixing or changing to rain. Feb. 3, 5 PM Update: The afternoon model run, with 72-hour results being posted just within the last few minutes, is confirming the general story of heavy precipitation, mainly snow, beginning during the day on Friday and extending into Saturday. The main difference is that precipitation amounts have increased from earlier runs. Feb. 3, 4 PM Update: The Washington/Baltimore local forecast discussion has been updated. As indicated here earlier, mixing or changeover to rain will be a major issue, but some very heavy snow amounts are still likely. REGION ASSOCIATED W/ THE PASSING UPPER TROF AXIS. Note that the first reference to p-type (precipitation) is undoubtedly a typo and should refer to all or mostly snow west of I-95, rather than east. LOCALIZED AMOUNTS OVER 20 INCHES. NIGHT AND SATURDAY...TEMPERATURES WILL BE 25 TO 30 DEGREES. Feb. 3 Noon Update: The latest model run, posted within the last hour, continues to show a major storm off the Mid Atlantic coast by Saturday afternoon. The timing has accelerated a bit, however, and the precipitation amounts, although still heavy, are a little lower. The storm evolution is now also within range of the higher-resolution NAM model. In general, it tells a similar tale, but with some subtle differences. The storm is slower, wetter, but also a little warmer. So what could possibly go wrong? Just ask the crack chefs at Momma Nature's Weather Grill why they keep such a large array of mops and other cleaning tools in their kitchen. The major risk to this forecast is the potential mixing or changeover of precipitation to rain for a while, especially as the storm is initially strengthening off the coast. Image (click to enlarge): Computer model forecast for 7 am Saturday, Feb. 6, shows a strong storm moving away from the Mid Atlantic Coast. Precipitation amounts in the Washington area would be in the range of 3-6" of snow in the previous 6 hours, with larger amounts earlier. Implied temperatures would be cold enough for snow southward through nearly all of Virginia. BAY AREAS WHICH WOULD BE MORE OF A RAIN-SNOW MIX/. Feb. 2 PM Update: This afternoon's view of Saturday's map shows a distinct jog to the north in the storm position, even in relation to the model run made just 6 hours earlier from this morning's data. At the 96-hour range, the general picture of a classic East Coast storm is coming into focus, but even a 72-hour forecast has an average error in storm location of about 175 miles, which makes a big difference in the weather at any particular location. For what it's worth, however, (and it can't be taken literally) the model is projecting an area of 1.5"+ of precipitation from the Carolinas northward through Virginia and into the southern two-thirds of Maryland. From about a line from DC to Baltimore northward, much of this would be frozen, so snow amounts of a foot or more would not be out of the question in some places. Assigning specific numbers, even in probabilistic terms, however, at this point is pure hype-casting. Feb. 1 Update: This just in: Model forecasts at the range of 5 or 6 days can have errors. Here's this afternoon's version of a forecast for the same time on Saturday. Notice any differences? The Hudson Bay high is not as cold and is centered further west. The low is still strong but not as intense. The heaviest precipitation is further south. Some of the differences are the result of faster timing. Other models have different ideas. So far, the indications are that the odds for snow are more favorable south of the Mason-Dixon line than north. At least some fanatics are likely to be disappointed. Back to our regular programming. After a week of hyperventilating over the prospect of what turned out to be 4-6" of mostly air in the Washington metro area, snow obsessive-compulsive disorder victims should brace themselves for the coming week. It's waaay too early to assign percentages, as a certain blog (they know who they are) does to pimp out their eyeball count, but the models are hinting at the possibility of a major east-coast storm for next weekend, Feb. 5-6. The latest run this afternoon of the GFS, the primary U.S. computer model, shows a pool of extremely cold air anchored over Hudson Bay and a strong low-pressure area developing off the southeast U.S. coast (click image to enlarge). The 6-day forecast, for 1 pm on Saturday, shows heavy precipitation (as much as 1" in 6 hours, roughly 10" of snow) from near Washington, DC southeast to Tidewater Virginia. Temperatures are indicated to be cold enough for snow as far south as central Virginia and eastward to the middle of the Maryland Eastern Shore. In short, all the ingredients from Momma Nature's Weather Grill cookbook. The BWI total is the 22nd highest in Baltimore records dating back to 1883. The record highest is 62.5" in 1995-6. Tune back in on Wednesday for final storm totals. Not counting the snow falling tonight, the Washington, DC seasonal snowfall total of 24" is the 32nd highest since records began in 1888. This year is also the highest since the number 6 season of 2002-3 with 40.4". 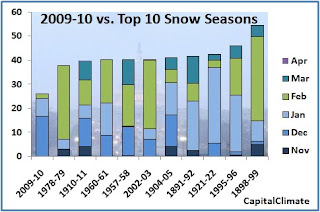 How does the year so far stack up against the top snow seasons? The chart shows month-by-month and seasonal totals for the current season and the top 10, including the all-time record of 54.4" in 1898-99. The chart will be updated periodically during the rest of the season as conditions warrant. 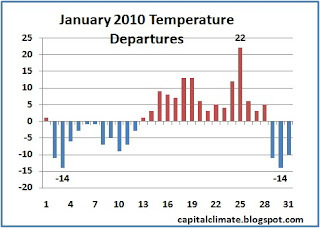 The new decade began with a cold first 2 weeks in the Washington DC area, followed by a warmer 2 weeks. A cold last 3 days brought the average of 35.3° for January 2010 down to within +0.4° of the 1971-2000 normal. 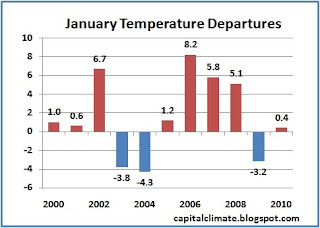 This marked the 5th out of the last 6 years in which January has been above average. In the 11 years beginning in 2000, 8 have been above average. 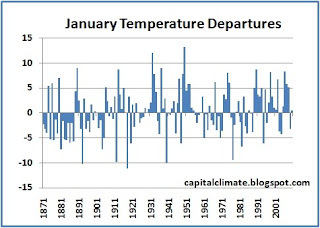 This January's average was also the closest to the long-term mean since 1987, when temperatures averaged just 0.2° below what is now the current normal. In fact, 2010 is tied with 1956 (-0.4°) for 11th closest to average out of 140 years of data. There were 23 days with lows of 32° or below, and 6 of these failed to reach a high above freezing. These were a little more than the normals of 20.7 and 4.6, respectively. Heating degree days totaled 914, just 0.3% below average. For the season the total is 2341, 2.5% below average. Despite the frenzy of the snow obsessive-compulsives, the only statistic which really stands out for this January is the precipitation deficit. Following an excessively wet December, the year is starting out at less than 50% of average. The preliminary total of 1.36" may have to be revised upward, however, as December's was. The reported 0.13" of liquid associated with 6.4" of snow on the 30th would imply an astonishingly high ratio of over 49:1 of liquid to frozen precipitation. Including the measly 1" of powder which fell on the 8th, the total snowfall was only a little more than 1" above average.